Need new apps for your favorite device? Here are 18 iPhone, iPad and iPod touch apps that just hit the App Store. 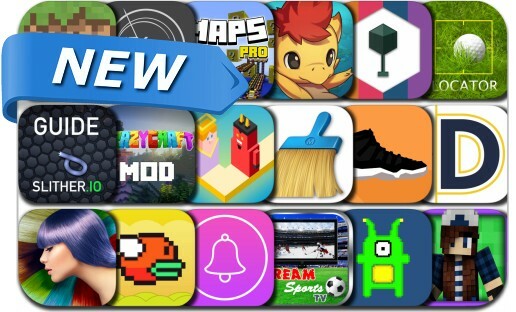 This new apps alert includes Snake Snither Run, Versus Run, Monster Raid, Cartoon Geek, Remix Ringtones for iPhone - Marimba Ringtone Remixes, Veera, Coolly Flying Birds Go Go, Sneaker Crush, Hair Color Lab and many others. Run away from your opponent through amazing mazes! Don't hit the obstacles and watch out for the moving tiles! Unlock as many characters as you can! They are so much fun. • Tap the right half of the screen to jump right • Tap the left half to jump left • Now RUN, RUN, RUN away! Keep up with the pace, be #1 among your friends! Remember the beautiful memories of your childhood. Watch all your favorite cartoon shows now for mobile. Discover thousands of the shows you know and love, in HD quality, right in the palm of your hand!